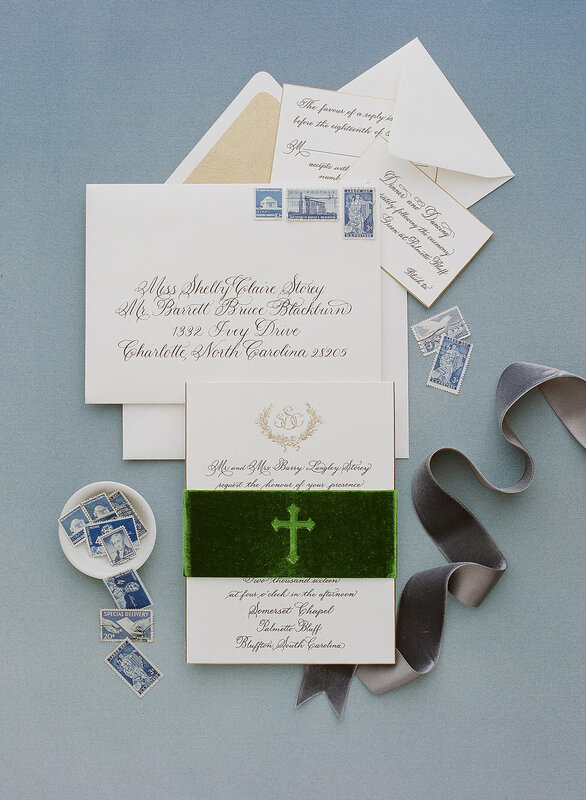 Seasons change, and so do wedding paper stylings in accordance… Winter is a lovely one and we couldn’t be happier to have more folks taking the plunge this season. 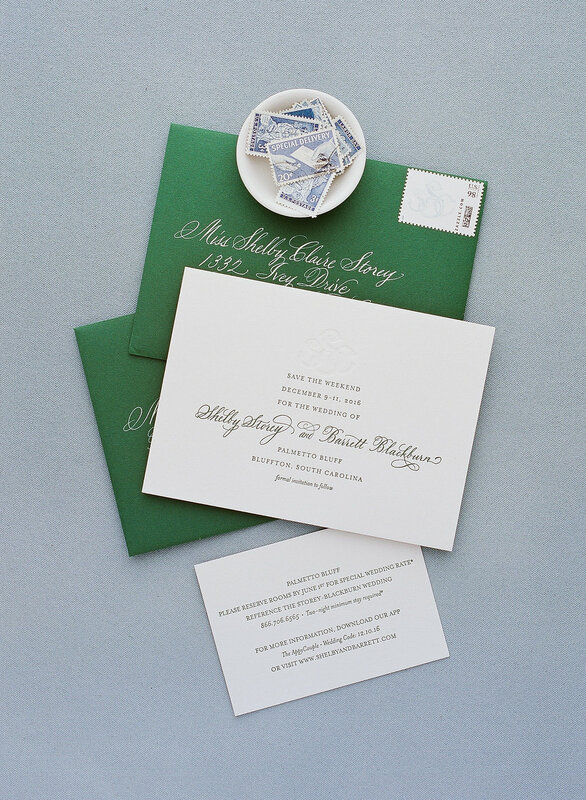 Here are some of our favorite winter wedding styles… This classic invitation suite starts with the thickest of paper letterpressed with hand written calligraphy. Then a velvet embossed ribbon is used for a belly band. 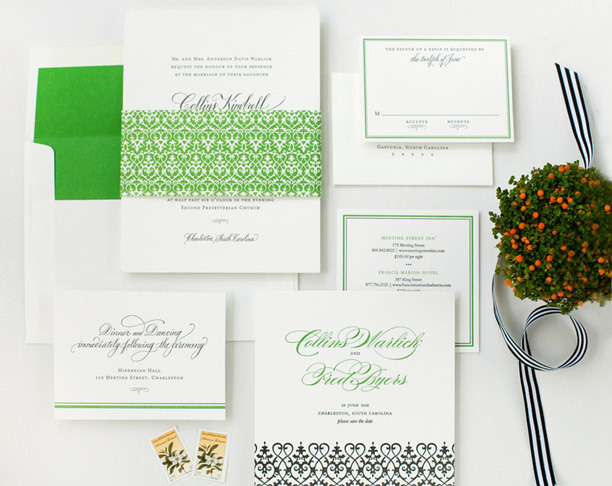 Here, for the same wedding’s save the dates, we embraced the color of the season and went with emerald envelopes written with white ink, such a lovely pop of color to receive in the mail. 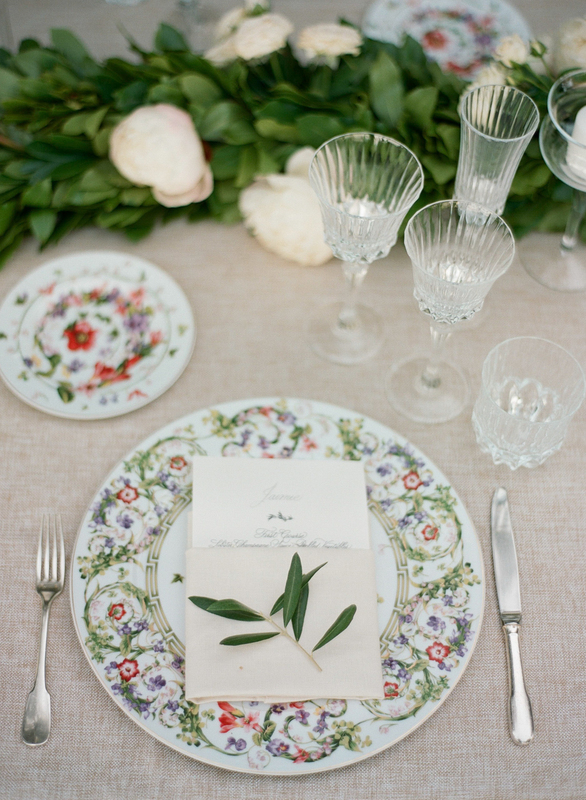 For those entertaining at home or at an event, the tablescapes and place settings can also be a place where people show their Holiday style. 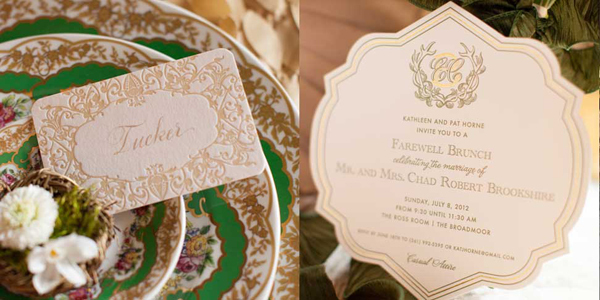 If you are going big with the place setting, a more simple hand written menu or place cards can be a nice purposeful touch. We also like to bring in seasonal elements this time of year. 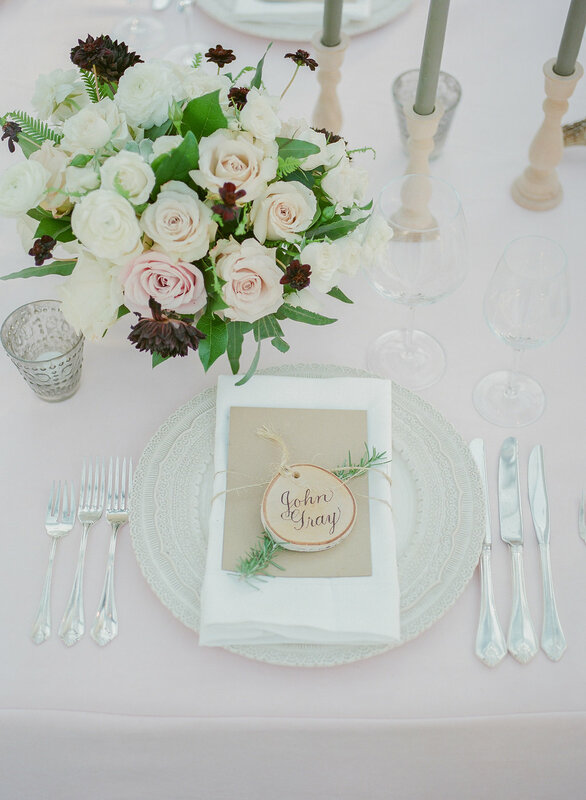 Birch wood slices caligraphied with guests’ names and a sprig of Rosemary give a chic winter feel to the table, and easy to do at home… Birch slices are available on Jamaligarden.com. And a metallic paint pen would be a pretty way to write the names… Some other greenery great for this time of year to consider – eucalyptus, pine, cypress, and holly would all be lovely. 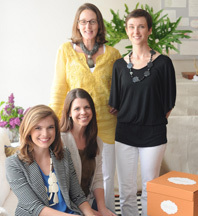 Design here by Tara Guerard Soiree. We loved designing this Christmas wedding welcome bag. 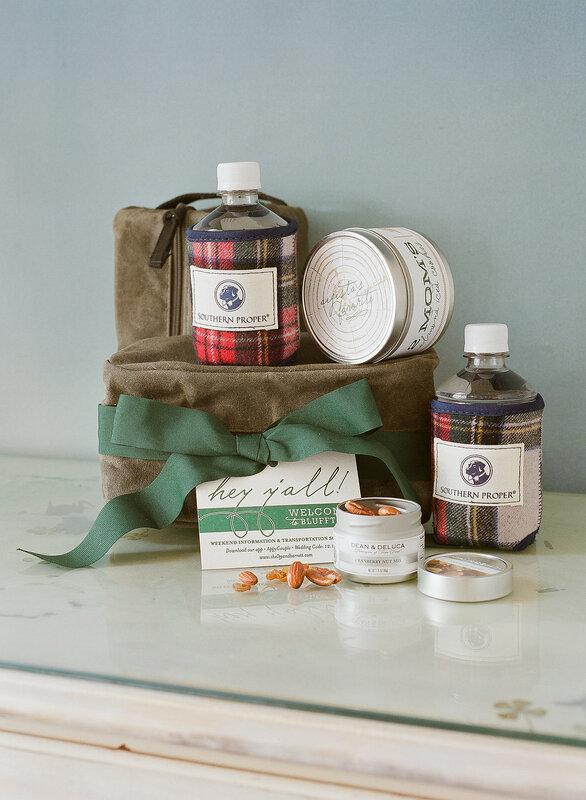 Tartan plaid koozies and seasonal snacks were a perfect treat for guests coming to Palmetto Bluff for the weekend.